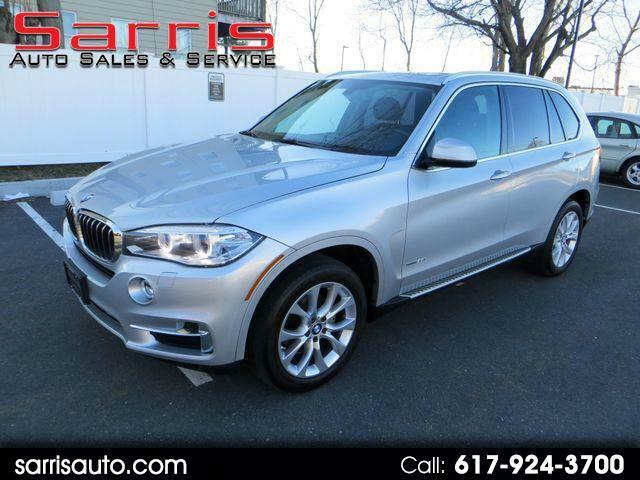 THIS IS A 2015 BMW X5 35I IN GLACIER SILVER METALLIC WITH BLACK NEVADA LEATHER INTERIOR WITH MANY OPTIONS AND ONLY 40,600 MILES. THIS BMW X5 IS A ONE OWNER WITH A CLEAN CARFAX. IT HAS MANY FEATURES INCLUDING,ALUMINUM RUNNING BOARDS,HARMON KARDON SOUND, LUXURYLINE PACKAGE, 19'' V SPOKE LIGHT ALLOY WHEELS, ROOF RAILS IN SATIN ALUUMINUM, 4 ZONE CLIMATE CONTROL, COLD WEATHER PACKAGE, HEATED FRONT SEATS, HEATED STEERING WHEEL, RETRACTABLE HEADLIGHT WASHERS,DRIVERS ASSISTANCE PACKAGE INCLUDING REAR VIEW CAMMERA, HEADS UP DISPLAY, UNIVERSAL GARAGE DOOR OPENER,COMFORT ACESS KEYLESS ENTRY, VOICE COMMAND SAT RADIO, BMW ONLINE, BMW APPS, ENHANCED BLUETOOTH AND SMARTPHONE, PANORAMIC MOONROOF, AUTO DIMMING MIRRORS, AUTO DIMMING REARVIEW MIRROR, POWER FRONT SEATS, LUMBAR SUPPORT, INTERIOR MIRROR WITH COMPASS, NAVIGATION, REAL TIME TRAFFIC INFO, PARK DISTANCE CONTROL, AMBIANCE LIGHTING, LIGHTING PACKAGE, XENON HEADLAMPS AND TRACTION CONTROL.